Gold has held its own as a responsible investment option for centuries, but how does it stack up against the profit potential of trading currency on the Forex market? Though both of these investment opportunities present the savvy trader with an ability to make money in both the short and long-term, they are two unique options that each offer noteworthy pros and cons. 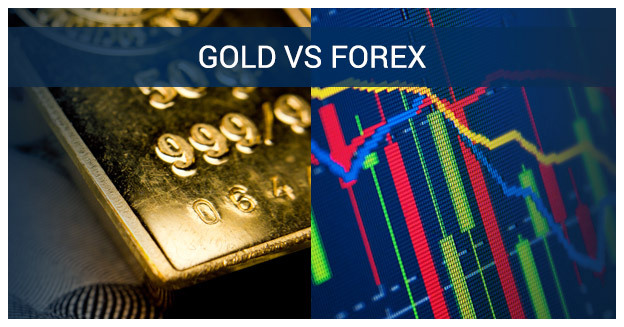 Let’s explore some of the features and drawbacks to investing in gold versus Forex. Gold has provided a medium of wealth preservation for centuries, and it is now easily tradeable through gold ETFs. Gold ETFs allow the investor to purchase gold and net the benefits of the precious metal, while foregoing the challenges related to purchasing and housing physical gold. ETFs essentially act as a mutual fund, with one unit of purchase representing, in most cases, 1 gram of gold. These units can be traded on the stock exchange just as you would trade a single share of a company, and transactions are generally managed in the same manner as a stock purchase. Forex trading involves a trader making calculated investments and speculations as to the relative valuation of a pair of specific currencies. A trader on the Forex markets may, for instance, predict that the value of the GBP is likely to increase in relation to the USD. Through a currency broker, the trader would then enact a currency swap and would recognise a profit if the value of the GBP rises as predicted. Gold, like other precious and scarce resources. has intrinsic value, meaning that there will always be somebody who wants to buy it, though not necessarily at the price you desire. Whilst physical gold can at times be difficult to sell, gold ETFs are easier to negotiate for the majority of investors. Although trading currencies on the Forex market is a little bit different to trading gold, currency also has intrinsic value. Through the Forex marketplace, it is even easier to trade than gold. One distinct advantage enjoyed by currency traders is access to a trading marketplace that is available 24 hours a day, 5 days a week. Forex traders can log in at 2 o’clock in the morning and initiate a swap, and they can take advantage of after-hours news stories and foreign market activities to make immediate adjustments to their investment portfolio. One key benefit afforded by Forex trading is the ability to invest using high levels of leverage. Whilst this is something that should be approached with a certain degree of caution, leverage can allow a new or seasoned investor to make significant trades without a large upfront investment. While this is a good thing for many traders, it is important to keep in mind that even small fluctuations in currency valuation can cause serious movements within an individual’s portfolio. You simply will not see this type of leverage potential available with gold investing. Many investment professionals think of gold as a stable and reliable investment vehicle. Whilst gold is certainly a standard-bearer when it comes to risk mitigation and consistent, albeit modest, returns on an investment, trading in the Forex marketplace provides a level of control that acts as a natural hedge against risk. Most online trading platforms require the trader to establish a margin call figure that will prevent a potential loss from wiping out the funds in a related investment account. This, coupled with the quick reaction times that are the hallmark of Forex trading, creates a controlled environment that naturally manages risk. Gold is generally considered to be one of the safest investments on the market today. It is a natural financial defence against market volatility, and the fact that it is a scarce resource with universal appeal makes it undeniably attractive for any investor who wants to minimise risk with acceptable return on investment. Forex, however, is a world of its own. Traders who have learned how to maximise the currency marketplace have shown that incredible wealth can be created in a short amount of time if a few key processes are put into place. In the end, there is no right answer when determining if gold or currency exchange makes a better investment. Each individual investor must weigh up the pros and cons of all of the investment opportunities on the market today in order to make an informed and intelligent decision. To get started with Forex trading, contact the experts at One Financial Markets. Guided trading assistance can make all the difference when learning to trade for the first time.